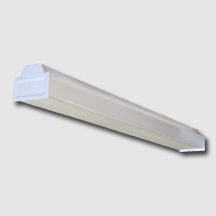 Low profile, single light fluorescent wraparound is a perfect complement fixture for corridors, stairwells, small office areas, commercial spaces, dormitories, and utility lighting. Lift and shift refractor for ease of maintenance and re-lamping. Complies with federal energy efficiency standards. Wire way cover easily removed without tools. Surface or stem mounting, single or continuous row. Wall mount application possible. Low glare, extruded acrylic refractor with a heavy gauge end plate with embossed light seal for dependable performance and great aesthetic appeal.